Telax Hosted Call Center announced today that TMC has named them as a recipient of a 2012 IP Contact Center Technology Pioneer Award from Customer Interaction Solutions, the leading publication in CRM, call center and teleservices industries since 1982. The Telax Hosted Call Center solution is an adaptable offering that is implemented in multiple markets across North America and the World with a focus on enterprise companies, the public sector, and service providers. Telax provides a contact center solution complete with IVR, ACD, reporting, and recording services, and also prides itself on being fully adaptable in order to meet the needs of a diverse range of clients. Telax provides software that is not dependant on the geographic location of call center agents, reporting that grows as new and existing customers demand more and more intricate access to information, and software features that go well beyond the capabilities of legacy call center solutions. 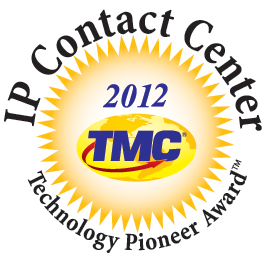 The 2012 IP Contact Center Technology Pioneer Award recognizes companies that have produced an innovative, successful IP contact center product or service. “Technology is the key to the success of any contact center. This award program acknowledges the achievers in the advancement of contact center technology and distinguishes the best in the IP contact center technology,” said Rich Tehrani, CEO, TMC. “TMC is pleased to honor Telax with an IP Contact Center Technology Pioneer Award for bringing superior, groundbreaking technologies to market while providing high quality and advanced applications,” continued Tehrani. Winners of the IP Contact Center Technology Pioneer Award are published in the July, 2012 issue of Customer Interaction Solutions magazine. Telax Hosted Call Center is North America’s leader in hosted call center solutions. Based in Toronto, Canada, Telax has been providing cloud-based business solutions to prominent public and private sector organizations since 1999. The simplicity delivered by Telax services enables clients like Best Buy, Northrop Grumman, Johnson & Johnson, CI Investments, the Globalive Group of Companies, Health Canada and the GSA, to reduce costs and improve efficiency, so that they can do more with their most critical resource: people. For more information, visit http://www.telax.com. For the latest Telax news, visit http://www.telax.com/category/news. Since 1982, Customer Interaction Solutions (CIS) magazine has been the voice of the call/contact center, CRM and teleservices industries. CIS magazine has helped the industry germinate, grow, mature and prosper, and has served as the leading publication in helping these industries that have had such a positive impact on the world economy to continue to thrive. Through a combination of outstanding and cutting-edge original editorial, industry voices, in-depth lab reviews and the recognition of the innovative leaders in management and technology through our highly valued awards, Customer Interaction Solutions strives to continue to be the publication that holds the quality bar high for the industry. Please visit http://www.cismag.com. TMC, celebrating its 40th Anniversary in 2012, is a global, integrated media company that helps clients build communities in print, in person, and online. TMC publishes the Customer Interaction Solutions, INTERNET TELEPHONY, Next Gen Mobility and Cloud Computing (formerly InfoTECH Spotlight) magazines. TMCnet.com, which is read by 1.5 million unique visitors each month, is the leading source of news and articles for the communications and technology industries. TMC is the producer of ITEXPO, the world’s leading B2B communications event. In addition, TMC runs multiple industry events: including Mobility Tech, M2M Evolution, ChannelVision Expo, MSPWorld, Super WiFi, SUITS, LatinComm, HTML5 Summit Conferences and more. Visit TMC Events for a complete listing and further information.